Republican congressional candidate Brad Zaun says he can “take the heat” of campaigning and won’t get “distracted” by a newspaper’s expose. The Des Moines Register published a story about a 2001 incident in which Zaun was told by police to stay away from a former girlfriend. 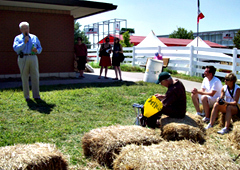 “As The Des Moines Register reported this morning, I had some tough times,” Zaun said this afternoon at the State Fair. After his speech, Zaun told reporters he believes the information about that 2001 incident was leaked to the paper by a “surrogate” of Congressman Leonard Boswell’s campaign. The police report indicates Zaun called the woman repeatedly and banged on the windows of her home in the early morning hours, shouting slurs. Zaun describes it as an “unfortunate” and “isolated” incident. During his speech at The Des Moines Register’s “Soap Box” on the state fairgrounds, Zaun said if he’s elected he will not ask for “earmarks” in budget bills to secure federal funding for projects in Iowa. Boswell — during his speech at the Fair — listed a variety of projects in the Des Moines area which were financed by the federal economic stimulus package. Boswell is unapologetic about bringing home the bacon. Boswell is seeking an eighth term in the U.S. House this November. Zaun is a former Urbandale mayor who currently serves in the state senate.